“I set up on my own in 2005 as a sole practitioner when my youngest child was nine months old. I worked two half days a week – and by the end of the year I had 25 clients and had increased to three days a week. After two years I took on an extra person and in 2011 another partner. It was a slow start – most of our work was referred by larger firms in London and we focused on doing a good job for the client. But as we became bigger we realised we had more mouths to feed and needed a more focused approach”. “While we nurtured London professional relationships we were neglecting the local market – clients were going to London firms and being referred back to us. We had no local presence. So we entered the Hertfordshire Chamber of Commerce awards and came second in 2011 for entrepreneur of the year. We noticed that some of the winners used a particular marketing consultant so we decided to get some external advice”. “We organised a half day strategy review where we realised that our unique selling proposition was that we were specialist family lawyers working in both London and St Albans. Someone gave us the cover page of Family Law Journal and we wanted to avoid the usual clichés about broken relationships. In the past we had sent holly bushes to our London referrers as a thank you and reminder and we decided to send them chilli plants with a message “Hot on family law”. “The marketing consultant helped us devise a campaign that linked the chilli image and message with the web site. 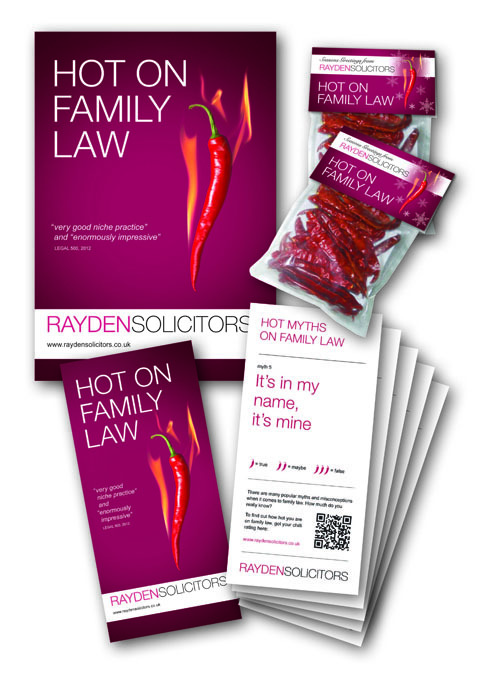 For example, we created an online quiz (http://raydensolicitors.co.uk/blog/hot-on-family-law/) to test whether readers were “Hot on family law” regarding six common myths. We invested time on internal communications to ensure all of our people talked to clients about our expertise in family law rather than just our location in St Albans with links in London. We employed another external expert to help us with blogging and social media – we are active on Facebook, LinkedIn, Twitter and Google+”. “The consultant also helped us with our subsequent submission to the next Hertfordshire Chamber of Commerce awards. Our success – both awards for Marketing Campaign of the Year and Outstanding Personal Achievement – there meant we were automatically submitted to the regional and then the national British Chamber of Commerce awards which we won”. “We thought that most people would be wrong about the common law myth but it seems that the one about things being in my name was the one that caused most confusion. So the next campaign will focus on that issue with the message “don’t leave things to the roll of the dice” and that’s the gift we will send out to referrers next. Another award through FSB (Federation of Small Businesses) gave us a £10,000 advertising prize so we will experiment with dice, boat, jewellery and boxing glove images to extend the campaign”. “In the last three years we have almost tripled in size. It has been exponential but organic growth. There has been a 53% increase in client referrals – and from new sources as well. The awards have added credibility and increased our profile nationally and locally as well as amongst an important business community. It even changed the perception of our own financial and professional advisers who now see us as a substantial and growing million pound business rather than mums earning pin money. After nine years we realised that we have to delegate some activity and that – even though there is a cost – we had to use external marketing expertise to integrate things into a coherent and effective campaign”. Nurturing strong referrer relationships remains a good strategy for many firms. What I find interesting about Raydens is that its progress is almost the opposite to the usual way practices develop – they get strong locally and reach out to London and nationally, whereas for Raydens the local market development happened afterwards. The core of much good marketing is to be clear about your market and your proposition. Raydens specialises in family law and concentrates in this area – although there has been a development of local as well as London and national markets. The integration of all business development activity around a differentiated campaign theme – the chillis and hot on family law – through gifts to referrers, the web site, advertising, blogs and social media activity, internal communication and direct client contact provides a cohesive and sustained effort that won the Chamber of Commerce “Marketing campaign of the year”. This award resulted in further profile raising in existing and new markets.